Welcome to the KCD Community Agriculture Map! KCD staff and a consultant team worked in late 2017 to design and develop this website. Our desire is for this site to provide a fertile space for Community Agriculture sites to grow and thrive, share information, recruit volunteers, and celebrate the growing impact of agriculture projects and programs in King County. “Community Agriculture” covers a broad spectrum of community gardens, food bank gardens, teaching gardens, and other projects and programs that promote food security and access. In 2015, King Conservation District (KCD) launched a new Community Agriculture program in King County. KCD is offering expertise and resources to schools, individuals, non-profits, and places of worship, helping expand access to healthy food and teaching important lessons on soil health, water quality, habitat, and natural resource stewardship in the urban landscape. KCD staff work directly with Member Jurisdiction staff and private land owners to increase the ability to grow food within our urban core. Food access and security has become increasingly important as we face the impacts of amplified population density, climate and weather pattern changes, and the threat of natural disasters. Additionally, King County includes USDA-defined food deserts, and one in five children in King County are food insecure (defined as reduced quality, variety and desirability of diet-with or with reduced food intake). See http://www.ers.usda.gov/data/fooddesert for more information. KCD is working to support community-based urban agriculture through education, technical assistance, partner matchmaking, and help in identifying possible funding and other resources. 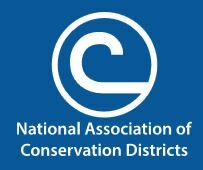 KCD works in partnership with Pierce Conservation District and Snohomish Conservation District on improving regional food access and security through information and resource sharing. KCD hopes to build onto this project in 2018 and beyond, to help promote community agriculture projects to elected officials and their jurisdictions, and help make policy or other support available. The web page will be a platform that could grow to connect projects across King, Snohomish and Pierce County. FREE Soil Testing – King Conservation District provides basic soil tests for all residents and municipalities in our service area. KCD’s soil testing program covers commercial farms, pastures, parks, home yards, and community gardens on private and public land. Interested in soil testing? More information can be found here on how to take and submit a soil sample. 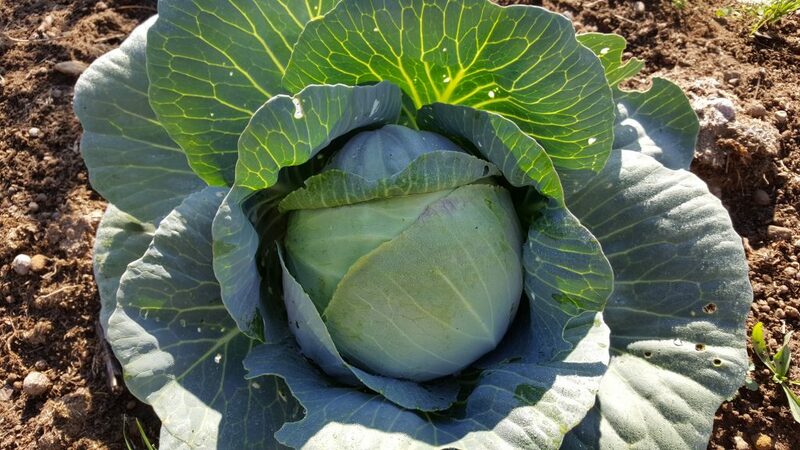 Community Agriculture Map – KCD’s Community Agriculture Map includes basic information about garden sites to promote and improve soil health. KCD encourages every gardener and farmer within our service area to conduct free soil testing using our program. The online map is a way for existing and future community food projects to be identified and located by volunteers, donors, or other partners. 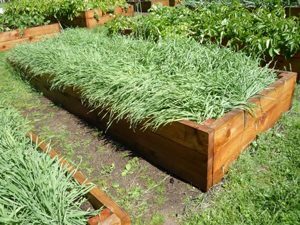 Hügelkultur – This ancient permaculture practice builds soil, creates increased and elevated planting area while keeping compostable materials out of landfills and burn piles. Hügelkultur mounds are suitable for urban, rural, in-ground and container applications. KCD offers hands on technical assistance to groups and organizations interested in creating hügel mounds. More information, including upcoming events and a Hügel Hunt map of sites across King County, can be found at: KCD’s Hügelkultur page. Volunteer Coordination – KCD can work with its Community Agriculture partners to facilitate volunteer efforts for community garden projects. Please get in touch with Melissa Tatro about your project and volunteer needs. More information can be found here on qualifying community garden project criteria. 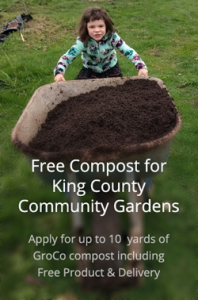 FREE Compost for Qualifying King County Community Gardens – KCD in partnership with King County Loop® Biosolids invite King County community gardens to apply to receive FREE delivery and product of up to 10 yards of GroCo compost (made with Loop®). Qualifying community gardens help meet the needs of underserved communities by improving access to healthy local food, parks and natural areas; help preserve healthy natural environments and create strong, vibrant neighborhoods. FREE Cover Crop Seed – KCD recognizes the importance of cover cropping to improve soil health. Cover crops protect soil from erosion and leaching of important nutrients and buffer against soil compaction during winter rains. Cover crops suppress weeds and provide habitat for native beneficial insects. In Fall 2017, KCD launched a pilot program to make cover crop seed available to qualifying community gardens. In 2018, KCD hopes to expand the program to backyard gardeners who have previously had a soil test completed and have taken steps to amend their soil based KCD provided soil test results. More Information on the Benefits of Cover Cropping can be found here.